NASA just announced the creation of a "Mars Helicopter" which, if successful, could help with scanning and surveying the Red Planet on future missions. NASA is planning to send a mini-helicopter to Mars for its next rover mission. The autonomous rotorcraft will be the first aircraft flying on the Red Planet. On Mars, a slope, a steep hill, or a deep ravine can bring rovers to a halt as they traverse the rugged terrains of the Red Planet. In 2016, NASA’s Opportunity Rover took on a precipitous Martian hill and got stuck. After several failed attempts to climb up the hill, the robot had to go around it to reach the other side. Earlier this year, Curiosity took shots of its target peak, called Mount Sharp, or Aeolis Mons, in the distance. It will take Curiosity years just to get at the foot of this 18,000 ft peak that it’ll never be able to climb. NASA has been working on the development of robotic aircraft that can overcome obstacles on the ground, and proceed much faster than land rovers. NASA’s JPL has just announced that it’s planning to send, for the first time, a helicopter drone to Mars as part of its next rover mission. Soberly baptized “The Mars Helicopter”, the craft that looks more like a drone has been under development since 2013 at NASA’s Jet Propulsion Laboratory. The helicopter is an autonomous rotorcraft that weighs less than four pounds. It’s powered by solar cells and lithium-ion batteries and outfitted with a heating mechanism for the cold nights on Mars. The Mars Helicopter will launch with the Mars 2020 Rover mission, scheduled for July 2020, to arrive by February 2021. 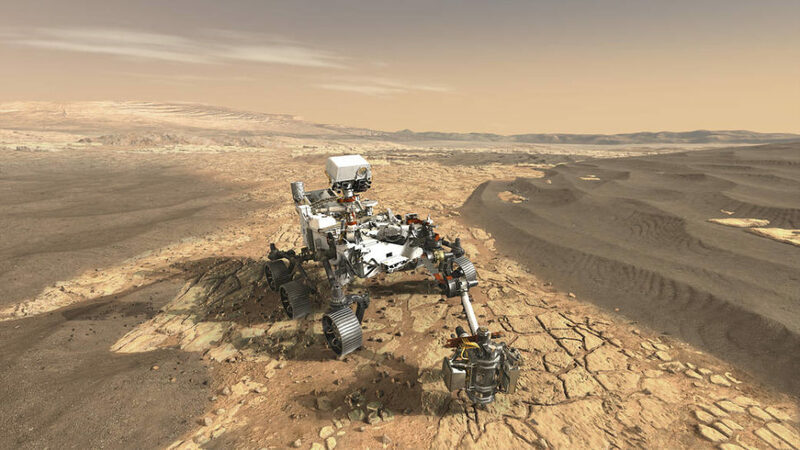 The Mars 2020 Rover is a wheeled robot like Opportunity and Curiosity that will carry on NASA’s Mars Exploration Program. Aided by the Mars Helicopter, the new rover will study the habitability of Mars and deepen the overall understanding of the planet. It’s not Easy to fly a Drone on Mars! With the Mars Helicopter, NASA aims to test the viability of flying heavier-than-air aircraft on Mars. Flying a helicopter on Mars is a lot harder than it may sound. The Martian atmosphere is about 100 times weaker than Earth’s because it is composed of more than 95% carbon dioxide. When the Mars Helicopter flies around in the Martian skies, it would be as if a helicopter were flying at 100,000 feet on Earth. The record altitude reached by a helicopter here on Earth is around 40,000 feet. If everything goes without a hitch, the Mars Helicopter will easily overcome natural barriers, and reach way further than any land rover ever could. If successful, do you think Mars Helicopters might be used by future colonists of the Red Planet?